I started making wonton wrappers out of laziness; I don’t like to go to the store just for one item when I have all the ingredients to make wonton wrappers. Often fried wontons can be heavy and greasy, these homemade wonton wrappers are light and very crispy when fried. The wontons are soft and silky when boiled. And best of all, there are no eggs, preservatives or food colors. 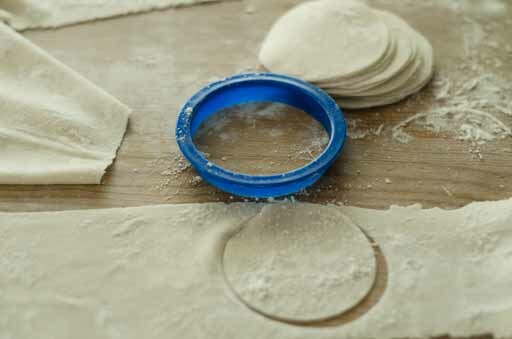 The process of making wonton wrappers is the same as making fresh pasta and noodles. It’s a lot of fun seeing the dough turning into a wonton sheet on the pasta bike. And if you have children, it’s worth getting a pasta bike for a fun time together. I find using pasta bike takes less time and gives wonton wrappers a more consistent texture than rolling the sheet out by hand. Resting the dough makes it easier to roll it out but, I find that I can roll it out right away with the pasta bike. Please note that the tapioca flour is for dusting at the end only. Add 2 ½ cups of all purpose flour, salt and water. Knead the dough until smooth, about 5 minutes in a mixer using the dough hook. The dough should be firm. You may need to add more flour. Add about a tablespoon at a time. 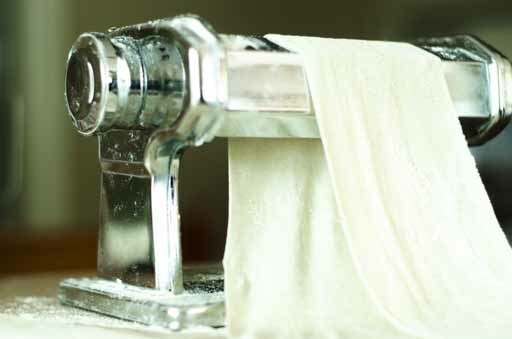 Wrap the dough and let it rest while you set up the pasta bike. You can roll the dough out by hand, but a pasta bike is much easier and you can get away with no resting period for the dough. The below instructions are for a pasta bike method. Set up the pasta bike and have the extra flour ready. Cut the dough in half, work on one while keep the other wrapped up. 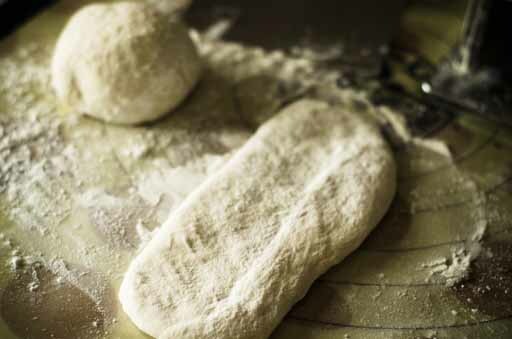 Knead the dough with more flour to firm it up. Then, roll out the dough into a long thin piece, using flour generously to keep the dough from sticking. Feed the dough through the pasta bike, using first setting; it’s 1 on my pasta bike. The dough doesn’t look smooth at this point, it’s very wet and maybe raggedy looking. 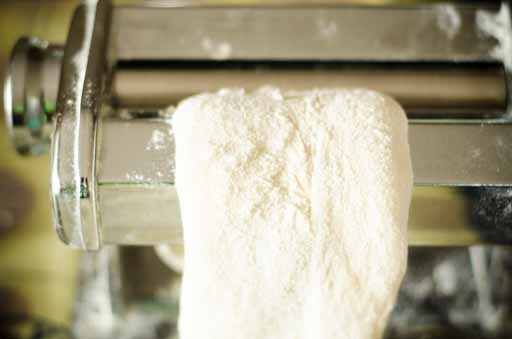 Fold the dough onto itself lengthwise to make clean edges and sprinkle more flour on it. Roll it out again with the pasta bike. 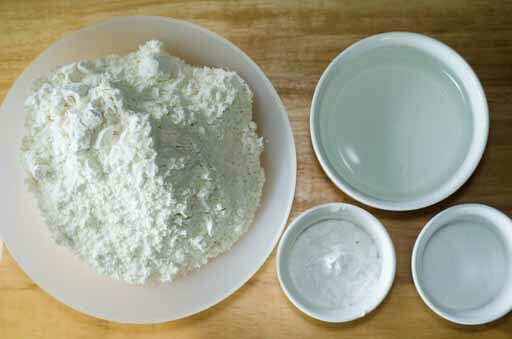 Keep the dough from sticking to itself by spreading out the dough that comes out from pasta bike and sprinkle more flour on it. Move the settings up to get a thinner sheet; it’s 3 on my pasta bike. Repeat the steps: adding more flour and spreading out the dough sheet. Move the pasta bike setting to get a thinner sheet. The last setting is at 8, the one before the last one. By now, the sheet is thin and resembles soft cloth in appearance. Make sure to keep sprinkle flour on the sheet. Now, the sheet is long and very thin. Cut it into 3.5 x 3.5 squares with a scraper, cookie cutter or scissors. If you need to trim the edges, you should have plenty of room to trim. You can also make a custom size. 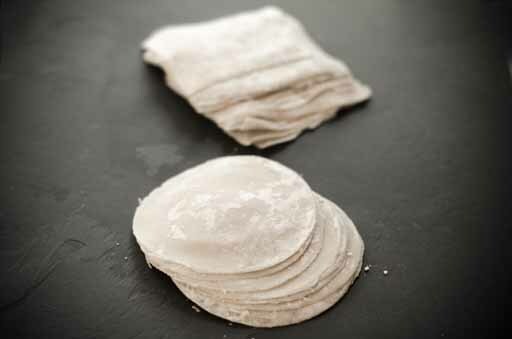 When all the wonton wrappers are cut, sprinkle tapioca flour or cornstarch in between the wrappers to keep them from sticking. You can use the wrappers right away or keep them in an airtight bag in the fridge or freezer.